Season One of Franklin & Bash ends with Go Tell It on the Mountain, an episode whose primary case had that mix of oddball and rational, while the secondary case was bad (and in some ways, almost racist). With the discovery of the body of Gordon Hawk, former partner to Stanton Infeld (Malcolm McDowell), Infeld find himself charged with murder. Up to his Unholy Trinity to get him off: his nephew Damien Karp (Reed Diamond), and the duo of Jared Franklin (Breckin Meyer) and Peter Bash (Mark-Paul Gosselaar). It is not easy for them to help, especially since Infeld's main defense attorney, Brett Cayman (Tricia Helfer) appears to be playing another game. Oh, and the fact that Infeld admits to killing Hawk. However, he insists he did this in self-defense and to protect the others on the hiking team, as Hawk had gone insane due to oxygen deprivation. Why Infeld didn't say this when all this first happened was that he wanted to protect Hawk's reputation rather than say that his friend had gone crazy. Well, that case is resolved, after a few twists and turns, by literally calling Gordon Hawk to the stand, or actually, taking a field trip to the morgue to see the body and Infeld's reaction. The coroner states that Hawk died while suffering from hypoxia, which could have made him go crazy. Infeld is a free man...and what could have been a touching farewell with an old friend turns comic when Infeld inadvertently knocks Hawk's head off. In the minor case, Lucha Libre wrestler Ultimo (Danny Trejo) is being sued to surrender his mask and his stage-name by the Fiesta Lucha League. Ultimo refuses, insisting that it is his identity. His daughter Amelia (Floriana Lima) asks Jared for help, while Jared just wants to help himself to the hot Mexican tamale. Hanna Linden (Garcelle Beauvais) comes in to help with the case against the two sleazy league lawyers. It looks like the judge will hold Ultimo to the letter of the contract, but through some legal technicalities involving the copyright of the wrestling moves (the league NOT having the rights to the signature moves of Ultimo) the case goes into limbo again. The league owners flee with other people's money, and Jared and Peter find themselves the new league owners. With Ultimo's rep restored, he does for Jared (who by now is involved with Amelia) what he refused to do for any man: he takes off the mask. There was something about the subplot that just didn't sit well with me. I think it starts out with that awful guitar playing whenever Ultimo was involved. That was so beyond stereotypical and clichéd. I really, really, REALLY HATED that we had to get a little guitar riff when Ultimo would show up. That struck me as rather insulting to however many Hispanic Franklin & Bash viewers (whom I suspect was a total of one, that being me). That is rather unfortunate, since in all other respects Go Tell It on the Mountain is actually a pretty good episode. The main case of Infeld facing murder charges, along with the machinations of Cayman slowly playing out to be exposed in dramatic fashion, all worked well. 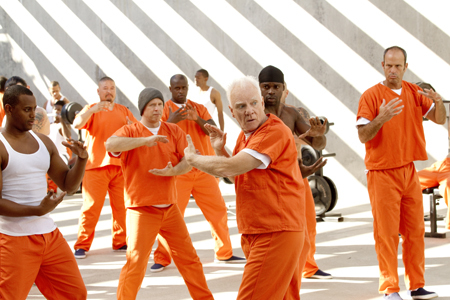 We even get pretty good comedy from McDowell when Infeld is leading a wushu tai chi class for the other inmates. He tries to keep a calm center, but eventually the legal matters require his attention. Without being overt about it, we can see in the background the Wushu tai chi has turned into a hip-hop fest behind Infeld's back. Again, what makes that wonderful is that it punctures a hole into Infeld's offbeat ideas without it coming across as so outlandish it can't be believed. Rhea Seehorn as ADA Ellen Swatello was again a great highlight as she's been every time she's appeared. Jumping ahead slightly, I can see why she was brought in as a regular in Franklin & Bash's ill-fated final season. We got pretty solid performances from the cast, which is no surprise given that they were given actual scripts to perform. McDowell in particular was effective, his comic manners while keeping a straight face never better than when he comes up to Hawk's corpse. He could show he can handle drama but when he knocks Hawk's head off, he doesn't overreact or come across as insane, but as more puzzled and embarrassed by it all. We even got a strange twist with Meyer's Jared. For once, Jared a.) wants to do actual work on a case and b.) feels shy around a woman. It's a great reversal for our cocky little man that might have been interesting to explore. On the whole, if it weren't for the over silliness of the Ultimo plotline (the league lawyers were os overtly sleazy and silly as to not take seriously), Go Tell It on the Mountain might have ended the season on a high note. Thank goodness the main case was actually solid and well-acted. Two things we might never say again about another Franklin & Bash episode.